This Stanhopea was the reigning queen of our greenhouse the last few days. 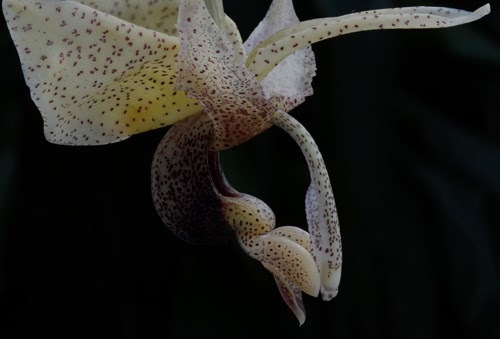 We received it with the label Stanhopea napoensis, and so I placed it in our warm greenhouse, where it was growing, but not particularly well. This year it produced one enormous bud, angular in shape, almost like an Embreea bud. When it opened, behold: our plant is actually Stanhopea platyceras. Stanhopea platyceras looks like no other Stanhopea in our collection. The entire flower is covered with plum colored dots that coalesce into inky blackness at the far end of the hypochile. 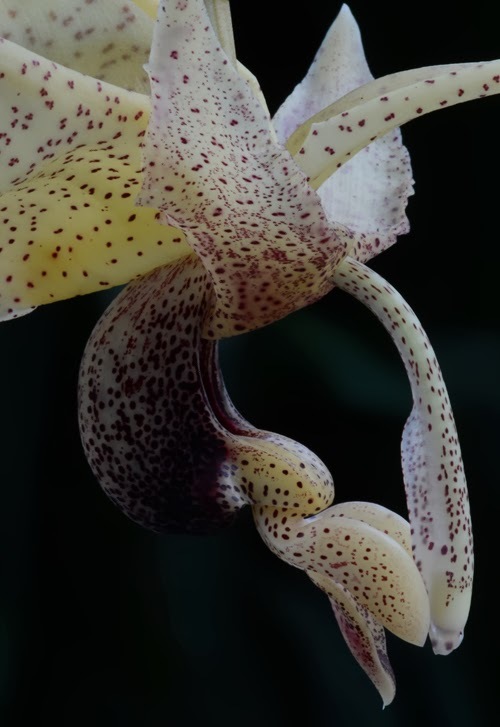 Stanhopea platyceras is endemic to Colombia, where it has been found growing at 1000 to 1500 meters elevation. No wonder it was unhappy in our warm greenhouse (65º F night minimum). Until recently we grew all of our Stanhopea species together in the same intermediate temperature greenhouse (60º F night minimum). It was convenient for us, but it wasn't really in the best interests of our stanhopeas. Over time, five degrees Fahrenheit makes a huge difference to plant. So I divided the collection between two (actually three) zones. We moved our warm growers, native to areas below 1000 meters, like grandiflora, lietzii and candida, to our 65º night minimum greenhouse. Species from 1000 to 1500 meters, the majority, stayed in the intermediate greenhouse receiving 60º night minimum. Cooler growing species I try to group closer to the wet wall in our intermediate greenhouse. This is just one way to grow Stanhopea species, tailored to a hot temperate climate like Atlanta's, where the night minimum outdoors is often 72º F in July and 20º in January. For a completely different perspective, check out Rob Laurie's blog, in which he describes growing stanhopeas outdoors year round in southern California.